Did you ever think about dipping your big toe into the waters of “prepping” but it just all sounded so “out there” that you weren’t quite sure it was something you wanted to be involved in? Then this is the guide for you. Maybe you’ve been witnessing the mainstream media’s demonization that makes it sound like those in the preparedness community are angry militia members, hoarders, or fruitcakes who are preparing for the next Great Flood. Well, I can’t tell you that extreme people don’t exist – they do, in every segment of the population. 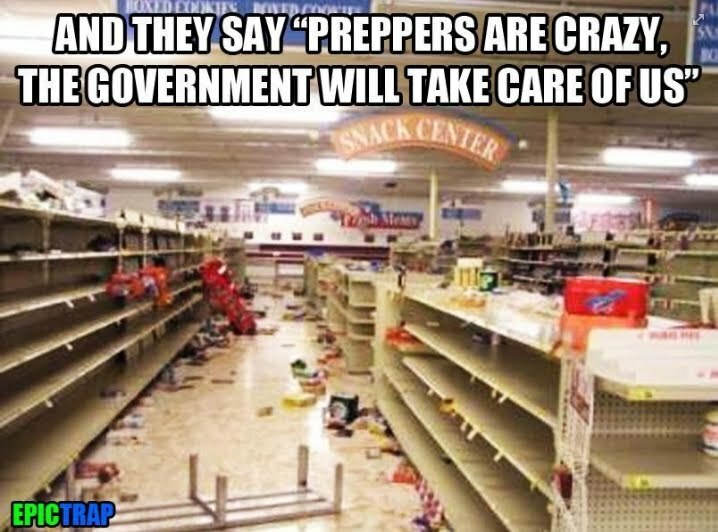 But most of the time, you’d never realize someone was a prepper unless they came right out and told you. One prepping family a know has a dad, a mom, 3 kids, a cat, and a dog. They live in the country with a few acres of farmland. They raise chickens. They stockpile. But they also go out to the movies, shop at department stores, and let their children go to sleepovers at other kids’ houses. They barbecue on the 4th of July, and they have ham on Christmas. Another family I know consists of a grandma and grandpa. They prep not only for themselves, but for their daughters, sons-in-law, and grandchildren. They go to church on Sunday, are active volunteers in their community, and have the best garden I’ve ever seen. My family is relatively normal too. I’m a single mom, with one daughter away at college on an academic scholarship and another daughter in high school. We live in a cute little Victorian house in the country. We grow veggies and there’s a chicken coop in the yard. I preserve what we grow and we have a tidy little stockpile stashed away just in case. For fun, we like to read and hike, and this year at Christmas, we’re having a Mexican fiesta instead of a turkey. I drive a “Mom” SUV and last year I was part of the PTA. You’d never know, running into any of us, that we are prepared to handle all sorts of crazy situations. We don’t wrap our heads in tinfoil, we don’t have bunkers (although,holy cow, it sure would be cool to find one already there when you bought that little old wartime bungalow you’ve been eyeing), and we don’t have to walk sideways through our halls to squeeze between all the boxes of supplies. The fact of the matter is, if you take OPSEC (OPerational SECurity) seriously, there are absolutely no obvious signs that your family is into preparedness. But that kind of prepper doesn’t make for good television or dramatic headlines. That’s why it seems like we’re ALL extreme, when that couldn’t be further from the truth. When they aren’t pushing the kooky extremist stuff or warning of a dangerous survivalist-run-amok, the mainstream media likes to poke fun at preppers. In pretty much every article, you see the word “preppers” residing inside a pair of quotation marks, like it isn’t even a real word, but is some kind of made-up term. Sometimes they go past poking fun to all-out scorn and derision. However, recently the media has warmed up to the idea of preparedness. It only took one man dying in Texas of a horrifying virus to get them to see that maybe preppers aren’t so crazy after all. Maybe this more positive coverage is why you’re here, reading this article. With all of the things going on in the world right now, you may be considering adding some preparedness supplies to your life. Read on and learn why you should take the plunge. I know, that sounds sort of gloomy. And I’m not a gloom and doom prepper at all. But sometimes disaster is the only word that fits. These are NOT outrageous Armageddon-style situations, but things that can happen to any of us. Nearly everyone has experienced one or more of these scenarios, and in each of them, some basic preparedness supplies would have made their lives much easier. We can’t control whether or not disasters happen, but we can control our response to them. A terrible storm: Most areas are subject to one or more types of bad weather. It could be hurricanes, tornadoes, flooding rains, blizzards, or ice storms. Whatever the case, weather can wreak havoc on entire regions. Businesses close, so you can’t get supplies. Sometimes roads are impassable, so you can’t leave home. Sometimes the power goes out (more on that below). Sometimes your area is battered for days, making it unsafe to do anything but ride it out at home. Contamination of the water supply. This seems to have been a recurring theme over the past year here in the US. First, there was a chemical spill in West Virginia that left 300,000+ residents without usable running water. Then there was an algae bloom in Ohio. Another chemical spill dumped arsenic into the water in North Carolina. After Superstorm Sandy, millions of gallons of raw sewage contaminated the water supply. These are not far-fetched scenarios, and in each of them, stores sold out of bottled water within an hour. Civil unrest: You need look no further than Ferguson, Missouri to get a glimpse of the kind of havoc civil unrest can wreak on a community. Riots, looting, and mayhem broke out after police shot a young black man. Many residents had to shelter in their homes because it was unsafe to venture out. There were reports of people running out of food after only 2 days of being in lockdown mode. There’s no warning before this kind of thing breaks out – you just have to be prepared ahead of time. Natural disasters: Earthquakes are not a far-fetched scenario for many of us either. Depending where you live, the likelihood of this type of situation increases. Earthquakes can cause structural damage, close down roads, cause power outages, and taint both municipal and well water supplies. Many areas are prone to specific natural disasters. An extended power outage: This happens in the wake of many different disasters – think Superstorm Sandy, Hurricane Katrina, Washington, DC’s Derecho, that horrible ice storm in the mid-south a few years back. The list of extended power outages is endless. natural disaster doesn’t have to occur, either. An attack on the power infrastructure or plain old computer or mechanical failure could also cause outages. A power outage may mean you can’t make purchases at any local stores because a) you only have a debit card and b) they can’t accept a plastic transaction without power, so they’ve closed for the duration. You may sit there and watch all the food in your refrigerator spoil. You may have no way to cook, no way to heat, and no light for nighttime. A little prepping goes a long way in events like this. Financial problems: This is a different kind of disaster, but one many of us can relate to, given the current state of the economy. What would you do if the primary breadwinner in your family suffered a job loss or a serious illness that made them unable to work? Would you run out of food within the week, be unable to keep the utilities on, or even lose your home? There are things you can do ahead of time to weather a financial storm. If you have a stockpile of food, health and beauty supplies, and other basic needs on hand, your limited money can be directed towards keeping a roof over your head instead of meeting your basic day-to-day needs. See what I mean? Is it really THAT unreasonable that any of the above scenarios could occur? They’ve happened before and they’ll definitely happen again. You can’t control the weather or the economy or the actions of an irresponsible industry, but you can be prepared to take care of your family. Fact #2: Official responses vary. It’s a lot like that with FEMA and other governmental response agencies. They get there when they get there, they dole out the supplies they deem necessary in the quantities that they deem appropriate. They can use these supplies to control you by requiring certain actions from you before you are allowed to have your rations doled out. You have to wait in line behind the others who got there first and take whatever is left. Heaven forbid you’re at the end of the line and supplies run out before you get any. Doesn’t that sound a lot like reverting to childhood? Do you really want to be dependent upon the whims of others for your basic necessities? Preparedness means you’ve taken responsibility for your family no matter what situation arises. You won’t be standing in the FEMA lines with an angry crowd, waiting for an MRE and a bottle of water to ration out across your family. It means you’ve embraced adulthood and you aren’t waiting to be rescued. Fact #3: Personal responsibility is actually a sign of excellent mental health. 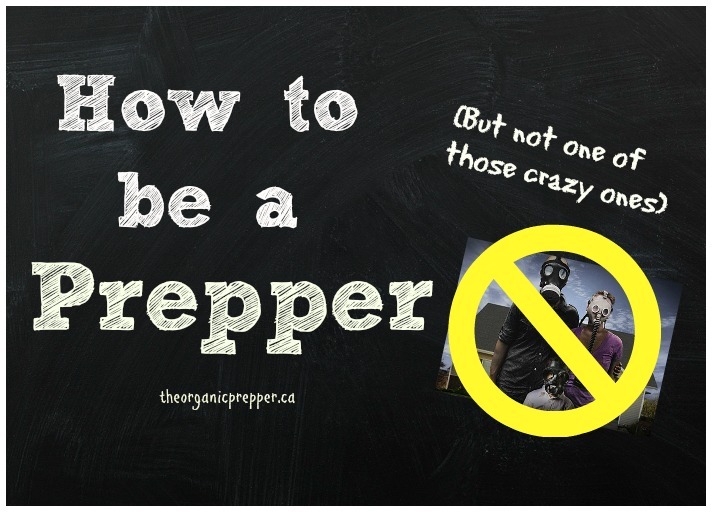 Speaking to the whole “preppers are crazy” stigma, don’t you think that taking responsibility for your own well-being is a sign of great sanity? In fact, wouldn’t the following be signs of poor mental health? When you look at the scenarios listed above, is it really at all rational to say, “This won’t happen so I don’t need to prepare”? They have happened, and they will again. Preparedness is the sanest possible response in the face of this evidence. Fact #4: Prepping is not gloomy. If you want to be able to peacefully meet challenges and provide for your family without panic, prepping is where it’s at. Even the kids deal better with scary situations when they know that mom and dad have things under control. Developing your skills and survival mindset will take you far in facing any challenge. Maybe the recent news headlines have brought you here, or perhaps a friend who cares about you emailed you a link to this article. If you’ve gotten this far and what I’ve said makes sense to you, here are a few tips to get your started. There are links in each section where you can go to learn more about that topic. At the end is a resource list with some shortcuts and some useful books. Don’t feel like you have to do every single thing RIGHT NOW. This is just a preparedness overview. If you never buy a single canned good or bag of pasta for long term food storage, please store water. Just this year, three communities have suddenly had water crises that left shelves cleared. A full month’s supply of drinking water for a family of 4 is approximately $150, give or take a little, depending on the prices in your area. I recommend the refillable 5 gallon water jugs for thisAs well, fill empty containers with tap water that can be safely used for pets, for flushing, and for cleaning and hygiene purposes. This is a small investment to make for your family’s security and well-being in the event of an emergency. Once you have water stored, consider adding filtration devices, secondary water sources, and water harvesting to your preparedness endeavors. You can learn more about water storage HERE, HERE, and HERE. Lots of preppers like to keep a year’s supply of food on hand. If you’re just getting started out, that can bein incredibly overwhelming. Start out smaller than that – focus first on an extra two weeks, then on a month’s supply. You can always build from there. Keep in mind when building your emergency food supply that you might not have electricity during some disasters. In that case, you’ll want to have food that doesn’t require lengthy (or any) cooking times. Look for just-add-water dehydrated foods, or better yet, foods that don’t need to be cooked at all. Find a list of foods that don’t require cooking HERE. Do not make the mistake of loading your pantry with nutritionless processed foods. In a crisis event, you want your body to work optimally, and junk in means junk out. Focus on nutrient-dense foods for good health and energy no matter what’s going on in the world around you. Learn how to build a pantry HERE. Find a short term food supply list HERE. A great starting point for someone who is just getting started on a preparedness journey is prepping specifically for a two-week power outage. If you can comfortably survive for two weeks without electricity, you will be in a far better position than most of the people in North America. Learn about prepping for a two week power outage in more detail HERE. It’s an unfortunate fact that disaster situations bring out the worst in many people. Because of this, even if you stay safely at home, you could be called upon to defend your property or family. Some people loot for the sheer “fun” of it, others consider chaos a free pass to commit crimes, and still others are frightened and desperate. You can have a 10 year supply of food, water, and medicine, but if you can’t defend it, you don’t own it. The article The Anatomy of a Breakdown explains the predictable patterns of social unrest. The best way to win a fight is to avoid getting into that fight in the first place. Secure your home and lay low, but be prepared if trouble comes to visit. Keep all the doors and windows locked. Secure sliding doors with a metal bar. Consider installing decorative grid-work over a door with a large window so that it becomes difficult for someone to smash the glass and reach in to unlock the door. Keep the curtains closed. There’s no need for people walking past to be able to see what you have or to do reconnaissance on how many people are present. Be armed and know how to use your weapon of choice. When the door of your home is breached, you can be pretty sure the people coming in are not there to make friendly conversation over a nice cup of tea. Make a plan to greet them with a deterring amount of force. Whatever your choice of weapon, practice, practice, practice. A weapon you don’t know how to use is more dangerous than having no weapon at all. Here’s some advice from someone who knows a lot more about weapons than I do. Have a safe room established for children or other vulnerable family members. If the worst happens and your home is breached, you need to have a room into which family members can escape. This room needs to have a heavy exterior door instead of a regular hollow core interior door. There should be communications devices in the room so that the person can call for help, as well as a reliable weapon to be used in the event that the safe room is breached. The family members should be instructed not to come out of that room FOR ANY REASON until you give them the all clear or help has arrived. Plan an escape route. If the odds are against you, devise a way to get your family to safety. Your property is not worth your life. It’s very important to make a defense plan well before you need one. You want to act, no react. Consider a portable propane heater (and propane) or an oil heater. You have to be very careful what type of backup heat you plan on using, as many of them can cause carbon monoxide poisoning if used in a poorly ventilated area. Also invest in a CO2 alarm that is not grid-dependent . It’s important to have a basic first aid kit on hand at all times, but particularly in the event of an emergency. Your kit should include basic wound care items like bandages, antibiotic ointments, and sprays. As well, if you use them, keep on hand a supply of basic over-the-counter medications, like pain relief capsules, cold medicine, cough syrup, anti-nausea pills, and allergy medication. Particularly important if sanitation is a problem are anti-diarrheal medications . In light of the current panic over Ebola, pandemic preparedness may be the very reason you’re reading this article and considering taking the leap. The good news is, if you’re prepared for other situations, you’re also prepared for many types of pandemics with only a few additions like protective clothing and specific sanitation supplies. In the event of a pandemic, the standard preparedness advice is to self-quarantine. You can learn more about Ebola-specific preparations HERE. Here is a general list of supplies to have on hand. Remember that sometimes power supplies are lost during a variety of situations, so keep the potential for a down-grid situation in mind when preparing. You don’t have to get everything all at once. Just get started and build your supplies as you can. After a quick inventory and re-organization, you may be pleasantly surprised at how many supplies you actually have on hand. Welcome to the preparedness community! We’re always glad to welcome people who are new to preparedness. Read books, go to websites, and join forums. While there ARE some curmudgeonly folks out there, most are delighted to answer questions and help you on your way. Please, don’t let the thought of all of the preps that you do not yet have bring you down. It’s a process. Once you know the possibilities, accept them, and begin to prepare, you are already far ahead of most of the neighborhood. Don’t be discouraged by how much you have left to do, instead, be encouraged by how far ahead you are compared to your former unawareness. Just making the decision to get started is the biggest step towards preparedness you’ll ever take.